Real Time Solutions of America Inc. designs and develops computer software for real-time systems and provides training and consulting services for customers. Our expertise ranges from supervisory control and data acquisition (SCADA) systems to management information and data mining solutions. Today Real Time Solutions of America is highly specialized in integrating security printing presses in enterprise IT systems. This document shows the usage of RTA - Real Time Architecture® and its specific implementation in press consoles. The shown architecture is an example of one solution that Real Time Solutions of America Inc. has implemented in the past. Due to the highly exclusive nature of our business we do not, neither during nor after a project, forward received information to a third party (i.e. person, institution etc.) which is/was not directly involved in the project. Even participating project members may receive information from us only to that extend that is required for completing their task. For this reason we do not advertise, do not compete on the common computer software market and provide company descriptions only in a personal form and only on demand for people that require our company profile. For this reason this document does not provide any information of the press console by itself. It explains only how RTA® supports such a console concepts. Based on RTA® numerous computer software systems are installed on newspaper and security printing presses worldwide. Alone in the US RTA® is installed a couple of dozen times on security printing presses, with the first installation starting back in 1989 for the BEP in Ft. Worth, Texas. For the newspaper printing presses RTA® is used in the US by every single site of Dow Jones to print the Wall Street Journal. Also others like the New York Daily have ABB MPS 730 installed, which is based on RTA®. · Redundancy management - RTA based clients (e.g. press consoles) can keep running without interruption and data loss even if the connection to the back-end is lost. a network-wide inter-process communication that allows data transmission rates between applications from 5,000 messages per second via standard networks up to 25,000 messages per second local on a 40 MIPS hardware (DECstation 5000/240). a network-wide, distributed, active, real-time database that allows up to 32.000 read operations per second on a 40 MIPS hardware (DECstation 5000/240). a supervisor function that has network-wide control over nodes and applications in redundant systems to allow real-time MASTER - STANDBY switching in case of system malfunctions. The above figures have been measured based on 10Mbit networks. Using 100Mbit or even 1Gbit networks in a distributed environment would result in much higher transmission rates. The CPU tests were based on DEC MIPS hardware. Modern Intel based (or compatible) processors can achieve much higher processing rates. RtIpC is a task-to-task communication, which is primarily designed for high-speed data transmission between applications. Data transmission can be done between applications within single nodes as well as between applications on different nodes in a network. Communication is even possible between nodes using different operating systems and network protocols. In contrast to conventional real-time capable database systems, RtDB represents a combination of an active, real-time and a relational database. Thus RtDB provides on the one hand an interface to the active real-time database for high-speed data processing and a SQL interface to the relational database for standardized data access. The integrity of the data between the real-time database and the relational database is assured by a synchronization mechanism, which automatically keeps track of changes in either of the databases. It provides for distribution of changed data between the two databases as well as providing for distribution of data changes between different nodes in a distributed or redundant system. RtDB uses RtIpC to distribute data to other nodes. Thus real-time database tables can be distributed in a network. 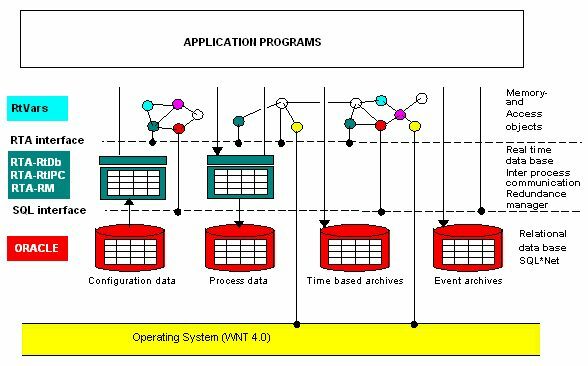 The real time redundancy manager is required for the implementation of redundant systems. It has network-wide control over all nodes and even over all important applications on each single node. Its job is to watch over all system components for malfunction and, in case a component fails, to activate specific routines like system restart or node switching (MASTER-STANDBY switching). RtVars are Real Time Variables that can be accessed using PL (Process Language) or Visual Studio program languages (like Visual Basic, Visual-C) via ActiveX. RtVars provide access to all necessary components in the system like RtDB tables, Oracle tables, operating system information (environment, timers etc.). RtVars can be active or passive. Active RtVars allow external triggers to be activated whenever the value of the RtVar changes. Due to that a system based on RTA® is very much event-driven. MIS - (Management Information System). These applications usually run on PCs that are connected to the Ethernet network. The SERVER serves as central database server. Therefore all CONSOLES and MIS stations connected to the Ethernet network have access to the data. The SERVER provides no direct coupling to the process, rather the data is received solely via the CONSOLE or MIS stations. All data is stored in the database of SERVER. If a separate SERVER is not available (e.g. stand-alone-press) the CONSOLE takes over the database functions as well having a local DB installed. Several drivers are connected to a machine getting data in real-time and trying to deliver that data into Oracle. Oracle might be too busy to insert or update a record immediately or a low priority process might lock a record. In this case no real-time can be guaranteed. A backlog could be the result, back to the process that is not able to deliver data to the locked component. This could in the worst case, depending on the implementation, cause a stop of the process itself. In case of a printing press this would happen after blocking the press-internal-network for more than 50 to 100 milliseconds. After that time the redundancy system of the press would, for security reasons, shut down the press by turning the main power off (emergency stop). RtDB does NOT implement any kind of rollback mechanism. The reason is that in a process automation environment a rollback is in most cases not necessary or even technically not possible => a printing press cannot move sheets backwards due to a rollback, the printing process just keeps going. Other solutions are provided to ensure consistency. RtDB can handle much faster update, insert and delete operations than Oracle. Therefore in order to synchronize date RtDB is delaying the update to the Oracle until a certain time has elapsed (DELAY - this time is configurable per each RtDB table). All changes are processed immediately in the RtDB table but the transfer into Oracle is deferred. Due to that RtDB is able to handle peek loads for a certain time (depending on the SIZE of the RtDB table and the DELAY). Since RtDB tables are memory resident the size of each RtDB table is limited to a certain number of records. Currently the limit is 65.536 (2^16) per each RtDB tables. Only records with a primary key HIGHER/LOWER than the highest/lowest record in the table are inserted into KEEP HIGHEST / KEEP LOWEST tables. The driver, pre- or postprocessor task has to provide for a kind of cache for the process data between the fast process and the (naturally) much slower SQL database. Usually this is implemented as an internal memory cache in form of a linked or hashed list. Unless this cache is kept in shared memory ALL client components, like archive program or visualization etc, that require process information have to QUERY the driver or postprocessor (the owner of this cache) to transmit the requested information. This results usually in a higher CPU consumption that increases with the number of clients (due to the required inter-process communication and the context switching that comes with it). This happens even in systems that have only clients requiring READ access. A typical client requiring mostly read access would be a visualization (VIS) task. This means that a system implementing the above architecture slows down proportionally with the number of (e.g. VIS) clients connected. A more sophisticated approach is to keep the process information in shared memory (what RTDB does). This approach avoids unnecessary data transfer between the clients and is therefore much faster. Due to that this approach is much more appropriate for real-time environments. But it is harder to implement and it is also a bit tricky. One has to know the nuts and bolts of real-time. Because the data is in shared memory, resource-locking mechanisms (e.g. 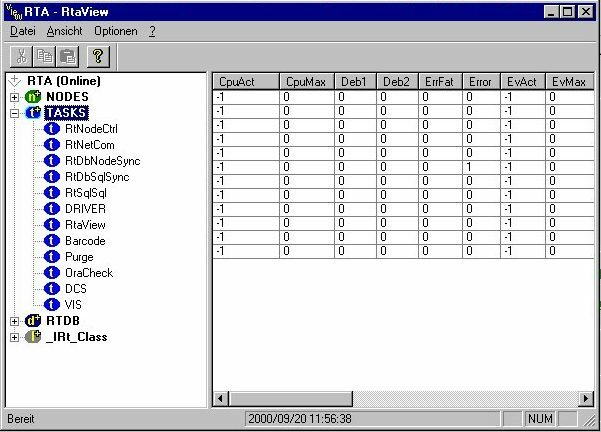 table, record or column locks) have to be provided in order to control access to the shared information. This and the fact that there might be processes with high priority (e.g. a driver that has to deliver data in milliseconds in to the database) and processes with low-priority (e.g. an archive that writes information every minute into a time raster archive SQL table) are the ingredients that can finally lead into a malicious situation know as priority-inversion. This is when a low priority task has locked a resource, e.g. some records in the RTDB, and is (slowly) processing them and not willing to unlock the records until it has finished its processing. At the same time a real-time task (e.g. the driver) needs instance access to that records. RTDB has of course implemented solutions for that kind of problem as well. But anyone who is not using RTDB or a similar product has to consider those and other real-time related challenges and provide appropriate solutions in order to make sure that real-time remains not just a phrase. This task is responsible for node and task supervision and re-start control. Restart is done in two phases. At first all the subsystems must be started and initialized (e.g. RtDb synchronization). Later the application programs will start. Restart is finished when all important application programs have reached the state "ready". The communication task that transports task-to-task messages over the network (TCP/IP). Each node in a network contains one task named RtDbNodeSync. This task is responsible for synchronizing RtDb-tables on different nodes. Insert and update operations are processed immediately. Updates operations are buffered and transmitted at configurable intervals. Buffering of updates improves performance due to decreased network traffic and increased block sizes. Each node configured with a SQL database can run RtDbSqlSync. This task is responsible for synchronizing data of RtDb and SQL. This task synchronizes tables defined in RtDb and tables defined in Oracle. With the advent of advanced replication features in Oracle 9 the value of this tasks functionality is diminished for systems that use Oracle user database subsystem. Sends and receives telegrams from the press controllers. The driver is connected to the press via a network or bus. It stores incoming telegrams immediately in RTDB tables and it receives outgoing telegrams also via RTDB tables. For each telegram type a different RTDB table is created (automatically generated from the telegram definition). The columns of the tables represent the individual data items of the telegram. This driver allows integration of various barcode readers for effortless input of all kind of production and maintenance related information. Depending on the actual configuration (customer dependent) this task purges unnecessary files from the hard drive and also obsolete data from the Oracle database. This keeps the press related part of the Oracle database basically maintenance free. This task checks permanently the connection to Oracle. If the network connection goes down, the server is shut down or the Oracle connection gets lost for any reason, this task reports an error message to RTA. The DCS is the AL/PL program that does all specific data processing. It is like a preprocessor in SCADA systems. The program is solely event driven. 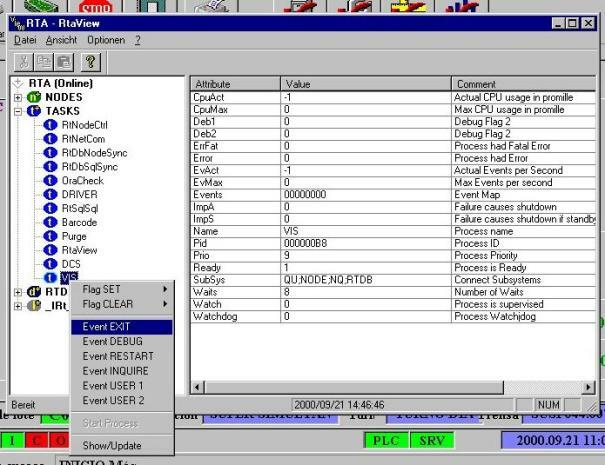 The program logic is described in form of ECA (Event-Condition-Action) rules. The ECA rules process mainly (but not exclusively) data in the RTDB. As soon as new telegrams arrive triggers a fired and the telegram specific processing is activated. The resulting data is also written into RtDB tables (specific tables that describe the business model). This allows customer specific post-processing being attached in a fairly simple way. The user interface of the press console. This program is also event driven and implements triggers (mostly VB ActiveX components) that are attached to various RTDB items and automatically updated when changes occur in the database. In order to start a program you have to press CTRL-ESC to launch the Windows Start Menu and then you have to select the path shown below. The RTA® console delivers, during normal operation, all data immediately to the Server's Oracle database via SQL*NET. In case that either the Server or the network is down, not allowing the RTA® console to deliver data to the Server, RTA automatically goes into 'client' mode and starts collecting information locally. This information is not accessible in the Server database until the Server or the network is up and running again. On the RTA® console a red indicator shows when the Server is not available. Some functions on the console, those that require data to be read FROM the server, are disabled until the server is available again. The system design makes sure that all data required for the redundant functionality is available in RTDB tables and as such still available even Oracle is offline. As soon as the Server goes on-line again, the red indicator light at the console turns green, indicating that the server is up and running again and all data that was collected in the meantime is automatically (without operator interaction) transferred to the Server. This method allows for a loose coupling of the RTA® consol clients and the Oracle server thus improving the overall system efficiency and production up time in 24/7 environments.